Viper's Venom is a superior high-sulfur cutting oil that is specifically formulated for cutting all ferrous metals. Ideal for tapping, threading, reaming, and lathe work. Works extremely well when threading or reaming stainless steel rifle barrels due to its extreme lubricity and cooling properties. I bought this cutting oil to replace some of the other oils I was using to keep my tooling cool and extend the life of them. Even though a thicker viscosity, this meets the metric and happy to have it. This is ideal for cutting gun barrel chambers and threading. Something for the gunsmith inventory. Great product, great service. Grizzly is my supplier of choice on this product and also many other products because of their support of shooting sports. Good Stuff! I need to write you about how I simply love my new Grizzly lathe and mill! Helps form good chips and makes drilling faster and easier. 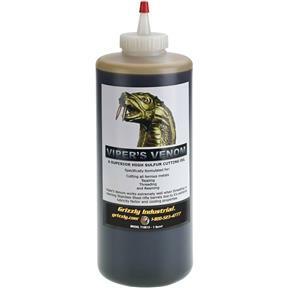 The drills are cooler after drilling with vipers venom than without. You can actually feel a difference (with a drill press or mill or lathe). You can feel it take less pressure for the drill to cut and for nice chips to form. I have not used it with end mills or with a lathe but you should still definitely get this.